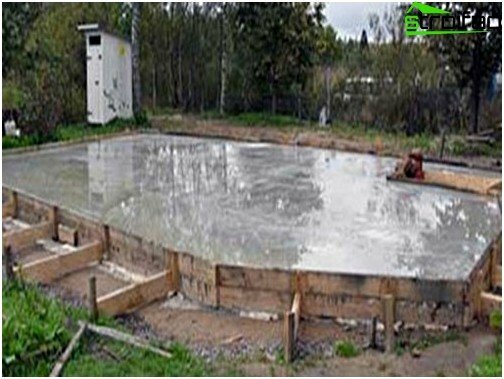 To date, the foundation slab can be onrightly described as the most common basis for the buildings. This is easily explained. 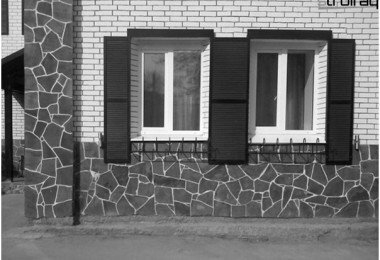 Thanks to a solid one-piece design made under the entire area of ​​the building, he was not afraid of the ground motion, because plate moves together with the house. 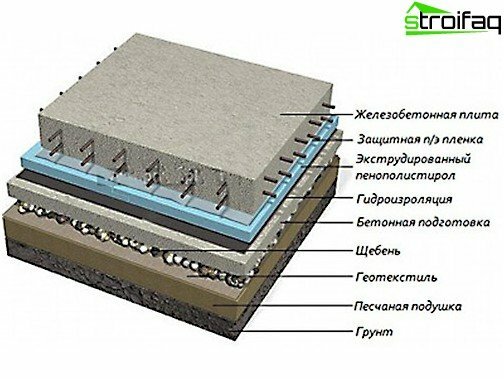 That is why the second name of this base - monolithic floating foundation. 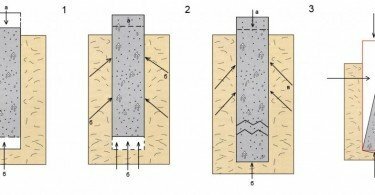 The base of the plates - the best way out of a difficult situationerection of structures on problem soils such as subsidence or heaving rocks. Construction of the foundation slab is shown with the prevalence in the moist soil area with enhanced levels of standing groundwater. 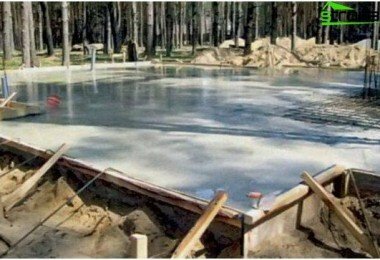 Slab foundation is considered ideal for creating waterproof protection for the ground floors and basements. if there is pressure on the construction site groundwater. 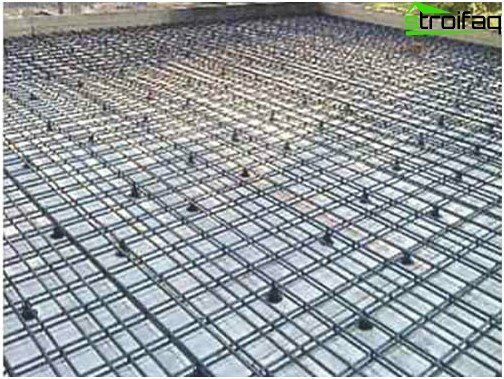 Visually, the foundation of the plates is a solid or latticed concrete slab penetrated fitting. The thickness may be different, depending on the calculations. concrete. Minimum value - mark M15 and frost resistance F 75. These components may vary depending on the soil type and climate. For example, if the climate is close to the average, the heater can only be used on the sides of the base. 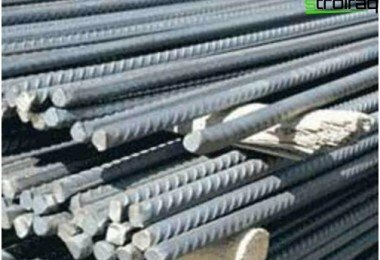 If construction occurs on the loose soils, it is necessary to increase the reliability of the foundation, supplementing it with reinforcing ribs. For lightweight constructions, such as a garage, you can use the cost-effective option - to build a framework of grids with cells of 1.5 x 1.5 m.
The thickness depends on the weight of the foundation of the building. For reference: the thickness of the base of a small house usually does not exceed 25-50 cm. 1. Low cost and ease of manufacture and assembly. 2. Good bearing capacity, due to a large area of ​​contact with the ground. 3. Overall, not subject to local deformation, the platform ensures the integrity of the walls of the house. In the cold period of the structure does not form vgibov and failures, as it is raised and lowered evenly. This is a valuable feature because the foundation is a rigid platform on which are the walls and columns. 4. The ability to use the plate as a "draft" floor basement. In this situation, you can not apply on the ground floor of accessories for ceiling, which saves a lot of money. Before manufacturing baseHousing need to calculate the slab foundation. It is at this stage, many developers willing to complete the entire scope of work on their own, admit mistakes irreparable. If you do not have construction education,calculate correctly unlikely because We must take into account many factors: the possible rolls, warping, shrinkage, load distribution on the entire surface of the plate, etc. Therefore it is better to turn to professional designers who will do everything quickly and efficiently..
1. Marking the territory of construction and soil removal. 2. Establishment of a geotextile flooring to create a barrier that prevents the transfer of sand to clay. 3. Formation of sand bags, which consists in backfilling the site with a mixture of gravel and sand, tamping manually or by compaction. Sand should tamp layers 10 cm. 5. 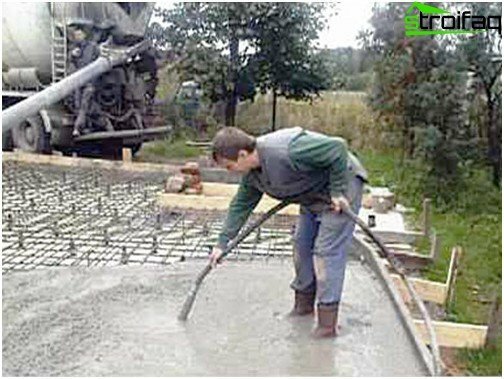 Production of concrete preparation - screed, cast in cement (M-100). The thickness of the screed - 10 cm. In the resulting concrete slab laid waterproofing materials, their seams are welded propane torch or blowtorch. waterproofing size should be larger than the size of the foundation of the future, which will allow to easily wrap up the edge of the deck. 6. 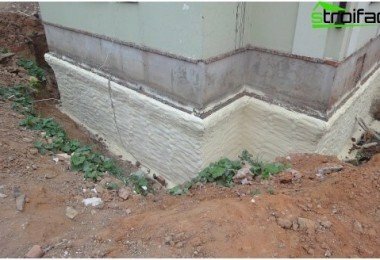 On top of the waterproofing layer is laid insulation of extruded polystyrene. Stage is not mandatory, but, in the future, providing a warm floor basement, will save on heating homes. 7. In the resulting "sandwich" mounted fittings. The frame consists of two nets (12-16 mm rods) refer to the size of cells 20h20-30-30 first grid mounted at the bottom of the basement (not more than 5 cm from the styrofoam) and the second -. In the upper (lower to upper plane of the foundation 5 cm). 8. On the perimeter of the slab formwork is laid carefully fixed. Manufactured with compacted concrete fill it manually or use vibrators. The concrete surface is leveled and smoothed. 9. Concrete slab covered with foil and allowed to stand for 4 weeks. In the first week of every day should moisturize foundation water. 10. After fixing concrete, waterproofing supply side folds up and is soldered to the ends of the foundation. Once a solid foundation is ready, you canmove on to further work on the construction of their dream home - cozy, beautiful and safe. 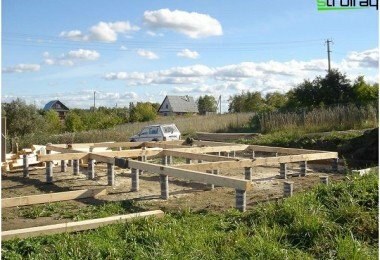 Remember, the proper organization of the process of the construction of the base of the building - a true guarantee of stability even in the most "capricious" ground.